Summary: A girl offers a stream-of-consciousness meditation on the world around her. It begins with colors: “They say blue is the color of the sky. Which is true today! They say the sea is blue, too. It certainly looks like it from here.” From the beach, she moves to a meditation on colors she can’t see, but knows are there like the golden egg yolk or her red blood. Later, her thoughts turn to the changing seasons, as she imagines herself a tree, first green, then brown, then covered with white. Finally, she moves back home, where she thinks of black, the color of her hair and of the crows she sees from the window as her mother braids her hair. 40 pages; ages 5-8. 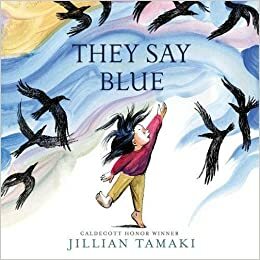 Pros: Caldecott honoree Jillian Tamaki has created beautiful (potentially award-winning) illustrations on every page , her colors and bold strokes of acrylics on watercolors perfectly rendering the various seasons and setting the narrator imagines. The wandering narration captures the spirit of children’s conversations. Cons: Some readers may struggle to figure out what this book is about.